Azerbaijani tar musician Shahriyar Imanov has given an amazing concert in Abu Dhabi, UAE. 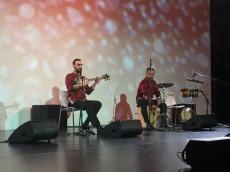 The musician was invited by the famous ud musician Naseer Shamman within the framework of the Literature and Music Festival dedicated to the International Arabic Language Day in Abu Dhabi, Azertac reported. Shahriyar Imanov and Shukur Aliyev (percussion instrument) shared the same scene with the professional musicians at the concert "Melody of words" . The gala concert was accompanied by teachers from Bait Al Oud Center on ud, kanun, drums and cello tools. Special attention was drawn to the works "Pulse" and "Crying Waterfalls" performed by local musicians and composed by Shahriyar Imanov. Marvelous event, which is of great importance in introducing the tar instrument in the UAE and the Arab world was attended by country's high-ranking officials and music professionals from nearby countries. The same concert will be held today in the city of Al-Ain. Shahriyar Imanov gave his first competitive entry took place in 1999 in memory of Haji Mammadov and won the 1st place.His first solo concert took place in 2001. The musician was accompanied by the Azerbaijan State Orchestra.In 2007, he won the Republican contest in memory of Akhsan Dadashov. He also took the 1st place at the International Mugham Festival 2013. Notably, tar is one of the most beautiful instruments in Azerbaijani culture and is played with a mediator. It is made from mulberry, walnut and pear trees, and the face of the instrument is made from cattle heart membrane. Its strings differ by thickness and composition. The music and craftsmanship of Azerbaijani musical instrument, tar, was included in the UNESCO list during the seventh session of the UNESCO Intergovernmental Committee for the Safeguarding of Intangible Cultural Heritage, in 2012.